Carolina Chinese Academy (CCA) offers a Chinese immersion program teaching the Chinese Language to children 2-5 years old in the Raleigh-Cary area since 2005. The program runs from Monday through Friday from 9:15 AM to 1:15 PM. Young children have an amazing capacity to learn other languages. Learning a foreign language at an early age also greatly enhances their cognitive development. Children in our program will learn to speak the Chinese language and will be exposed to Chinese culture through stories, songs, rhymes, arts, crafts, and group play. Children will be taught primarily in Chinese once they attain a basic understanding of the language, and will begin writing simple Chinese characters to enhance their motor skill. A fun, loving, nurturing environment will be provided. 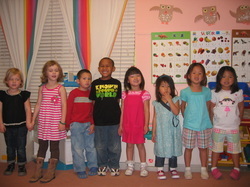 Our staff is highly educated and fluent in both English and Chinese and has lots of experiences working with children. Weekly Preschool Program 2019-2020 now enrolling!